I know that there are some people who take body modification to the extreme, having plenty of piercings in different places of the body, not to mention tattoos in various spots of their skin, but what about those who are extremely averse to pain, and yet intend to be part of the crowd who have inked their skin and have had more piercings than a traditional tribesperson? 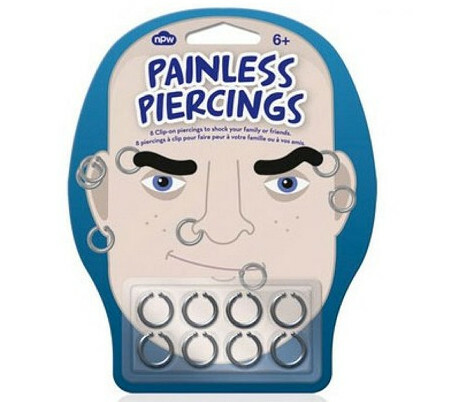 Enter the $5.95 Painless Piercings then. After all, if there are fake tattoos available in the market, it would make plenty of sense to see the inclusion of painless piercings, right? These can be removed when you do not want to give grandma a shock the next time you visit her, and each purchase comprises of a set of 8 plastic fake piercings that won’t set the metal detector off at airport security.